Saturday morning (2/8/14) we met a couple to pick up this bed off craigslist. We had been looking for a darker frame to match his other furniture but this deal was too good to pass up. It's a sturdy frame in great shape and also came with a mattress and box-spring (which we are storing under the bed for now to help it not be so high), and mattress pad and a set of white sheets! All for what we would have had to pay for just a frame. We got it put together Saturday morning, but we wanted to let him pick out sheets so he slept in the crib for nap time on Saturday. Then after nap we ran to Ikea where he picked out the green sheets; matches his room pretty well huh? This was right before bed Saturday night, he was pretty excited about his big boy bed. 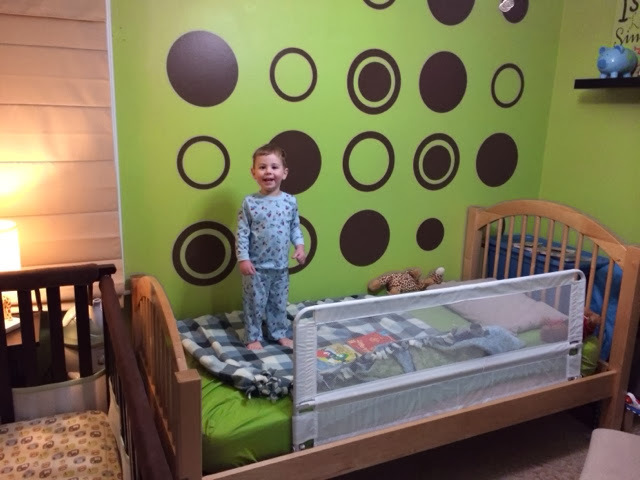 We had the bed rail that we use upstairs on our bed (well we used it when he was little and plan to have it available when the babies come if needed) on his for the night but a friend ended up dropping off a smaller one that fits his bed better the next day. This rail is actually the tallest I could find out there because we needed a tall one for our tall mattress. Way to tall and rather long for his bed. He did great his first night (and every night since actually). 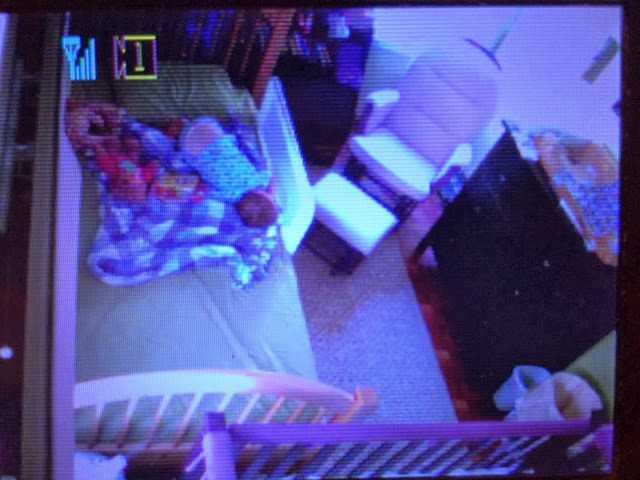 It was funny to watch him Sunday morning because he woke up, looked around... slowly crept his way to the end of the bed where the opening was, climbed down every so slowly... stood up in his room and looked around. Then scurried back into his bed and sat on his bed looking at the door "mama! mama!" like he did from his crib. It made us laugh upstairs as we watched him on the video monitor. Since then he just wakes up in the morning, or from nap and just reads in his bed like he used to do in his crib. He is such a "bookies" lover that he has to have a hefty size stack of books that he sleeps with every night so there is never a book more than arms reach away from him. 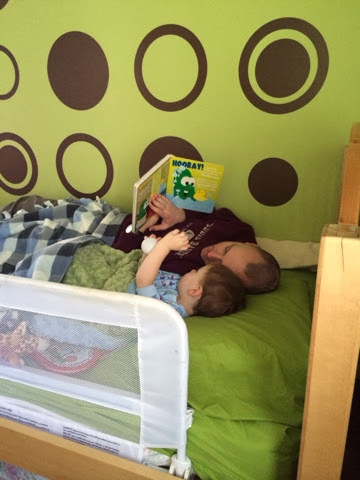 Here he is reading with daddy before nap-time on Sunday. This how he eventually fell asleep Sunday for nap-time. Holding his plastic baseball, lol. As you can see the bedrail our friend loaned us is shorter and definitely makes it easier for me to get in and out. I had to take a photo of him sleeping during nap this day... maybe it was Monday. 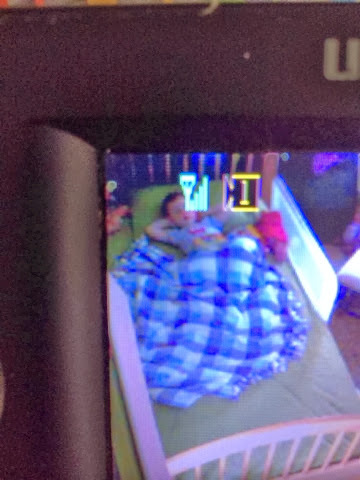 The numbers on the edge of the monitor are kinda in the way but you can still see how he's snoozing with both arms behind his head.